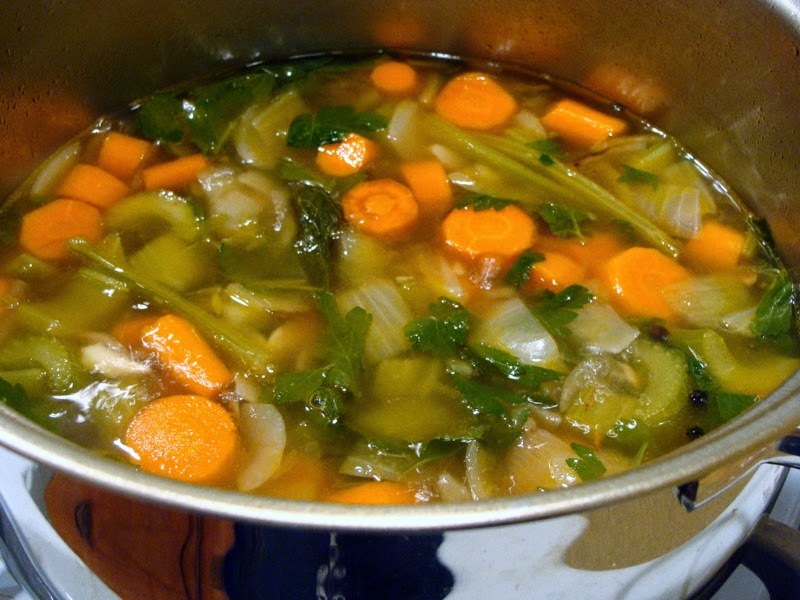 All good vegetable stocks start with a base of onions, carrots, celery and garlic. From here you can experiment with whatever is hiding in the back of the fridge. I added some radishes and bean sprouts as they were languishing about however you don't want to use vegetables that are rotten and some strong-flavored vegetables, such as cabbage, asparagus, Brussels sprouts, broccoli, and cauliflower can impart strong flavours so you might want to leave those if you need to whip up a quick stock. Read here to check out some good veges to use for your stock. This stock went well in the Chicken Casserole and Prawn Dumpling soup. Heat oil in a large stock pot over high heat. Add onions, ginger, garlic and salt & fry for a couple of minutes. Add carrots, celery, spring onions and coriander, reduce heat to medium-high and fry, stirring often, for a further 5 minutes or until veges are lightly browned. Add water to pot and bring to boil. Reduce heat to a gentle simmer, skimming the surface with a ladle to remove any impurities. Simmer for 1 hour, skimming as required. Strained stock through fine sieve (lined with muslin if required) and cool. Store in the refrigerator for up to 5 days or in the freezer for 2-3 months.